As a wildlife photographer, I have long been fascinated with the symmetry,design and patterns found in the animal world. Many times a pleasing photograph is the result of harmonious shapes and color tones or an engaging subject that affects the viewer through actions, an intense stare of an eye or a languid stretch after a cheetah's cat nap on a termite mound. Photographs capture moments that will never reoccur. Still photography allows the viewer a luxurious moment with the subject and validates the illusive emotion I felt at the moment of capture. The images I share are reflections of how I see our beautiful, complex world. In making my animal designs I call "Animasques", I present designs resulting from compiling many identical images to form something that didn't exists before. In a way, it reverses the way of looking at photographs as a compilation of many small dots of color information, With Animasques I take animal forms and arrange them to create designs. The process begins with selecting a strong image with either powerful shapes,textures or colors. The photograph must have a compelling feature to it, but what that is is illusive and what I call the "unknown" factor. I extract the animal from the background in Photoshop CS2 and make multiple copies of it. Each identical form is moved about to experiment with resulting combinations of patterns and forms. I try to combine the design to stay true to the animal. 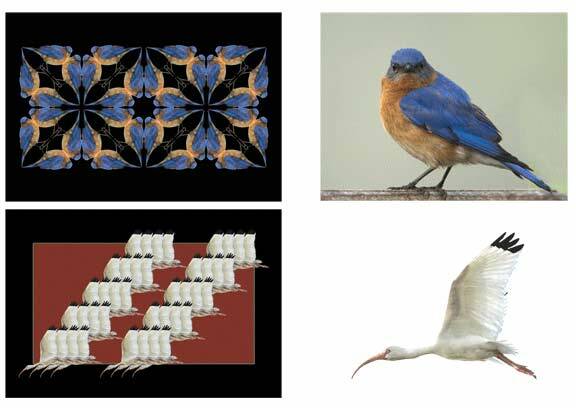 For example, if the animal is a bird in flight with magnificent feathers, the feathers become the focal point of the design, Many times the designs are layered or rotated. Others are simply touching each other or mirrored duplicates that combine to form new shapes. Each Animasque is made from just one image. Some of the designs require a bit of concentration to make out the original photograph but others are less of a challenge. My latest Animasques have been derived from a photographic safari to Kenya, Africa this January. Perhaps they will share their essence with viewers in a new meaningful way.